Antigama is an “avant grind” band from Warsaw, Poland. It’s a fitting description, since the grindcore they play and the soundscapes they create are anything but ordinary. The band has released several full-length records and numerous splits (including one with your humble editor’s band) and has toured Europe and the States, so it’s high time they were interviewed here. The latest release is Stop the Chaos, an EP on Selfmadegod Records. Via email from Poland, Sebastian, the founding member and guitarist, brings us up to date on his band. “Last year we’ve gone through heavy line-up changes. Since the beginning with Pawel on drums [a recent member of the band] the chemistry between us has been great and we’ve made the new songs very quickly. First we planned to record just 2-3 songs for a 3-way split w/ Noisear and The Kill. But we’ve made more new songs and decided to put out also a full EP. It is out now because Karol from Selfmadegod was very keen on this idea, so now we’re waiting for the split—he’s not out yet! “E Conspectu” from Stop the Chaos sounds more like a “normal” grindcore song, which is atypical for Antigama. Note: Producer Szymon Czech, who recorded the EP, as well as other Antigama records, and spent time in the band on bass, died in November 2012, after the release of Stop the Chaos. A. Yes, about the same. B. Yes, if not more so, but I do a better job of hiding it. C. No, I play avantgrind—I’ve gone beyond Voivod and Napalm Death. Stop the Chaos is available from Selfmadegod Records, and there’s even a deluxe edition that’s boxed and features a sticker and a pin, but is limited to 100 copies. Get it while it’s hot. 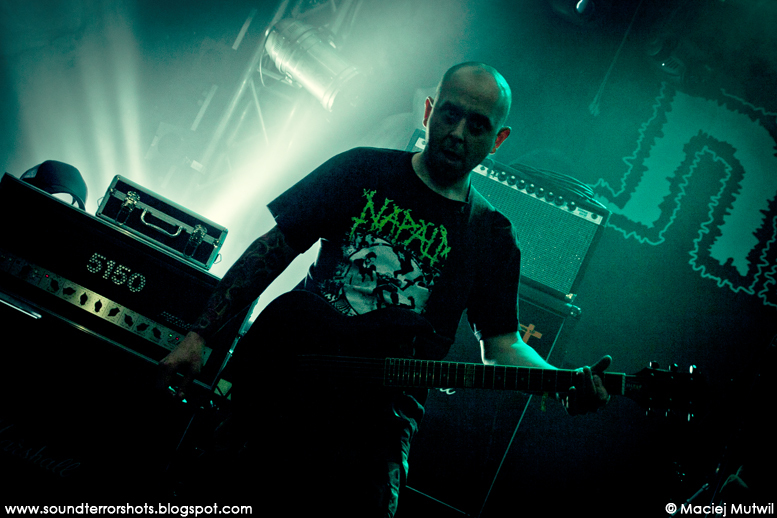 This entry was posted in Interviews and tagged antigama, Napalm Death, Selfmadegod, voivod by Editor. Bookmark the permalink. For U.S. folks, Unholy Anarchy has limited amounts of both the Red and White Vinyl editions of ‘Stop the Chaos’, as well as the CD (all imports).